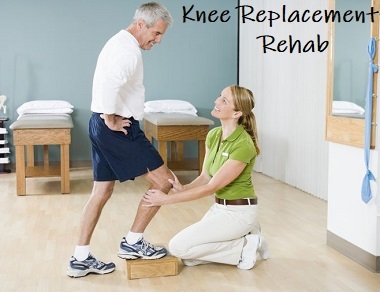 Effective knee replacement rehab is vital if you want to get the best results from your new knee. It doesn't matter if it is a total knee replacement or a partial knee replacement, the rehab process is essentially the same. When done correctly, rehab will help you regain movement, strength and balance, enabling you to get back to the activities you love, or even allow you to take up new ones. Knee replacement rehab exercises will help to increase the amount of movement at your knee, so you can bend and straighten it fully, and improve the strength of your knee muscles. These will make your daily activities such as walking and climbing stairs much easier. Knee replacement rehab should start before you even have surgery. By doing exercises before surgery, you can improve the strength and flexibility of your knee. Before your surgery, as well as talking things through with your surgeon, you should also be given the opportunity to see a physical therapist. They should go through a knee replacement rehab programme consisting of exercises to help you regain your knee movement and build up your muscle strength. They will start with simple exercises that you can do lying down in bed and sitting in a chair and progress on to more advanced exercises to do in standing. For the first few weeks, you will need to be doing exercises at least twice a day, every day. Over the weeks as the knee gets stronger and looser, your day to day activities will increase and you'll be able to cut down gradually on exercises. You may need to continue with exercises for a few months - don't stop until you have regained full strength and movement in your new knee. Remember, it is well worth starting knee replacement rehab exercises before you have your operation to get your muscles stronger as you will recover quicker from the operation. How much you stick to your rehab programme will have a big impact on the outcome of your knee replacement. If you exercise regularly, you will end of with a very strong, mobile knee that allows you to do almost anything you want. If you don’t exercise your knee you run the risk of developing long term stiffness and weakness in your knee which will limit function e.g. walking and climbing stairs. In the knee replacement rehabilitation section you will find a whole range of simple and effective exercises to do both before and after knee replacement surgery to help you get the best out of your new knee. There are easy to follow instructions and videos as well as guidance on how to progress. Always check with your doctor or physical therapist before starting new exercises.